During the past few years, Joss Whedon's reputation has taken a lot of well-deserved hits, both personal and professional. With that in mind, I assumed his much-heralded return to the Buffy comic 'verse would be something special. 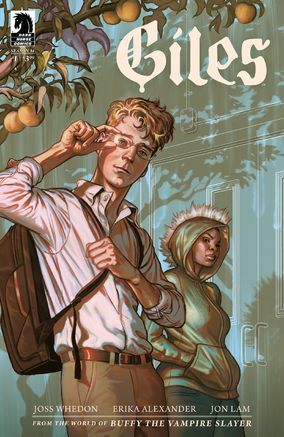 Sadly, I was wrong: there's nothing in the first two issues of the four-issue Buffy the Vampire Slayer: Giles miniseries that makes me miss Whedon at all. According to The AV Club, Whedon and co-author Erika Alexander had big plans for BtVS: Giles. Whedon said he “wanted to tell a story about education, class, and race in America”. Apart from some clunky metaphors about charter schools, almost none of that translates to the text. Thus far, this is a story about a de-aged version of Rupert Giles embedding himself in a post-apocalyptic modern high school. He's hoping to root out a murderer, but only if his suddenly overwhelming teenage hormones don't trip him up first. Admittedly, I am a little behind on the BtVS comics, so maybe I'm missing out on some nuance here. I really like John Lam's art, and I snickered over a few of the jokes. But the pacing of this series is odd and abrupt, the characters are underdeveloped, and the romance is really underdeveloped. Sure, I will probably finish this... but only because there are only two more issues and I'm too lazy to call my local comic book store and tell them to take it out of my file, which is far from a glowing recommendation.